The complete nucleotide sequence of the mitochondrial genome was determined for a conger eel, Conger myriaster (Elopomorpha: Anguilliformes), using a PCR-based approach that employs a long PCR technique and many fish-versatile primers. Although the genome [18,705 base pairs (bp)] contained the same set of 37 mitochondrial genes [two ribosomal RNA (rRNA), 22 transfer RNA (tRNA), and 13 protein-coding genes] as found in other vertebrates, the gene order differed from that recorded for any other vertebrates. In typical vertebrates, the ND6, tRNAGlu, and tRNAPro genes are located between the ND5 gene and the control region, whereas the former three genes, in C. myriaster, have been translocated to a position between the control region and the tRNAPhe gene that are contiguously located at the 5' end of the 12S rRNA gene in typical vertebrates. 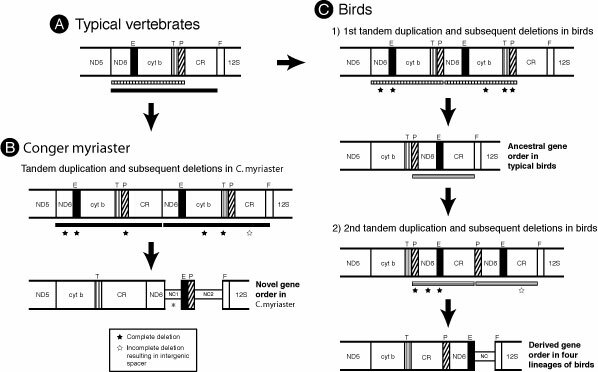 however, the relative position of the tRNAPro to the ND6--RNA-Glu genes in C. myriaster was different from that in the four birds, which presumably resulted from different patterns of tandem duplication of gene regions followed by gene deletions in two distantly related groups of organisms. Sequencing of the ND5-cyt b region in 11 other anguilliform species, representing 11 families, plus one outgroup species, revealed that the same gene order as C. myriaster was shared by another 4 families, belonging to the suborder Congroidei. Although the novel gene orders of four lineages of birds were indicated to have multiple independent origins, phylogenetic analyses using nucleotide sequences from the mitochondrial 12S rRNA and cyt b genes suggested that the novel gene orders of the five anguilliform families had originated in a single ancestral species. Inoue, J. G., Miya, M., Tsukamoto, K., Nishida, M. 2001. 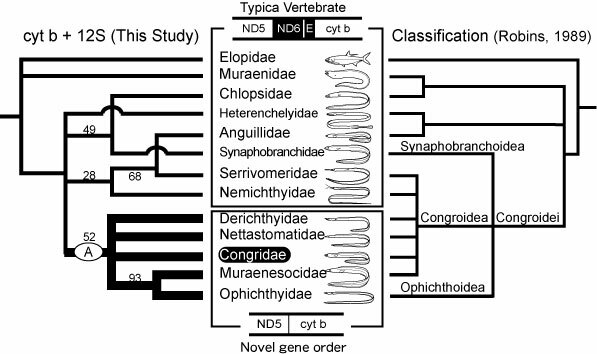 Complete mitochondrial DNA sequence of Conger myriaster (Teleostei: Anguilliformes): novel gene order for vertebrate mitochondrial genomes and the phylogenetic implications for anguilliform families. Journal of Molecular Evolution 52, 311-320.